Password reset is one of the most important functions performed by Password Manager Pro in order to protect the sensitive resources from unauthorized access. Password Manager Pro allows you to carry out similar tasks by invoking scripts or executables, referred to as Password Reset Listeners. What are the follow up actions you can do using password reset listeners? Restart the dependent services immediately after password reset. In case of a Windows service that makes use of an account whose password is reset locally in PMP database, the reset listener helps change the respective 'stored credentials' (i.e the credentials specified in the 'Logon' property) of the windows service. Reset the passwords of Windows scheduled tasks and other associated processes. Carry out password resets for network devices. For instance, if you have added the accounts of network devices as resources, you can first reset the passwords of such accounts locally and then invoke a custom script to connect to the devices and execute the changes in the device as well. How does a password reset listener work? Password Reset Listener is a script or executable that can be invoked by you whenever the password of an account is being changed or reset in the Password Manager Pro repository. This password reset listener can be invoked even for local password changes and also for resources for which remote password reset is not supported out-of-the-box by PMP. You can configure listener scripts individually for each resource type including the user defined resource types. The password reset listener script will be invoked in a similar fashion as it will be from the command prompt of the operating system from which it is invoked. In case, the script needs another program to invoke it from the command prompt, it could be provided as the 'Pre-Command' for that script (for example 'cscript c:\scripts\changepassword.vbs old_password new_password). By default, the parameters resource name, dns name, account name, old password, new password are passed as arguments to the script. You can also add additional arguments by specifying them against the text field "Additional Parameters" at the time of invoking the script, in the order specified. The script runs with the same privilege as the user account running the Password Manager Pro server. For Security reasons, dual control mechanism is implemented, which will ensure that two administrators will see and approve the script before it is invoked by Password Manager Pro. Password Manager Pro will not invoke the script unless it has been approved by both the administrators. For example, when an administrator adds or edits the password reset listener, Password Manager Pro will not invoke the scripts unless it has been approved by the other administrator. Thus, the add / edit / delete operations related to password reset listeners can be successfully executed only with the approval of two administrators in PMP. The actions are also audited for future references. The password reset listener is invoked from a separate thread, so it does not impact the password reset process of Password Manager Pro. The listener scripts added will be stored in the same database as the other information. This provides security and also backup, if it is configured for PMP database. Navigate to Admin >> Customization >> Password Reset Listener. The Password Reset Listener window will open. Click "Add Listener". As mentioned above, the password reset listener script will be invoked in a similar fashion as it will be from the command prompt of the operating system from which it is invoked. In case, the script needs another program to invoke it from the command prompt, it could be provided as the 'Pre-Command' for that script (for example 'cscript c:\scripts\changepassword.vbs old_password new_password). Enter a name for the listener. Next, browse and add the listener script. By default, parameters such as resource name, dns name, account name, old password, and new password are passed as arguments to the script. In case you require to pass additional arguments, add additional arguments by specifying them against the text field "Additional Parameters". The additional parameters supplied will be passed to the script in the order given, at the time of invoking the script. You can also specify the resource types for which the changes to be applied and send approval request to the other administrator. After adding necessary details, select an administrator from the drop down for sending an approval request. A mail will be sent to the selected administrator intimating the approval request. Who can add password reset listeners? The listeners can be aded only by Password Manager Pro administrators. In addition, all listeners added should also be approved by a second administrator to guard against potential risks associated with invoking arbitrary scripts. So, once a listener is created and saved by an admin, the same will be sent to another administrator for their approval. A mail will be sent to the second administrator intimating the approval request. Click the link under "Approval Status" column, beside the listener which has to be approved. Once you approve, the listener will take effect. The listener creation, edition, deletion, and approval events are all audited. 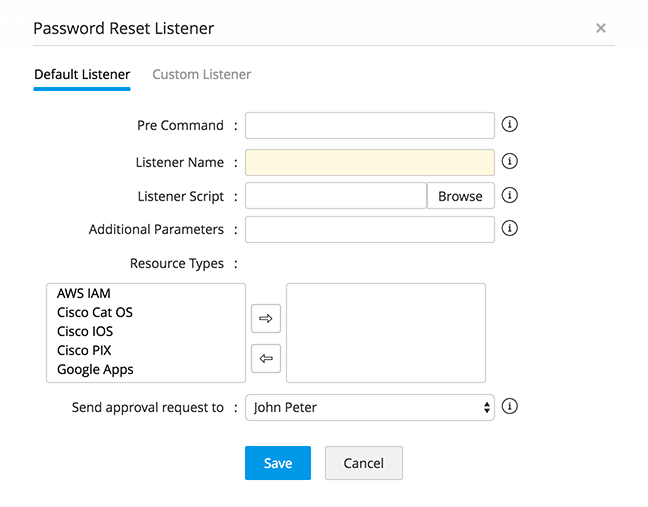 In addition to reset listeners, Password Manager Pro allows you to provide your own implementation through "custom listeners". 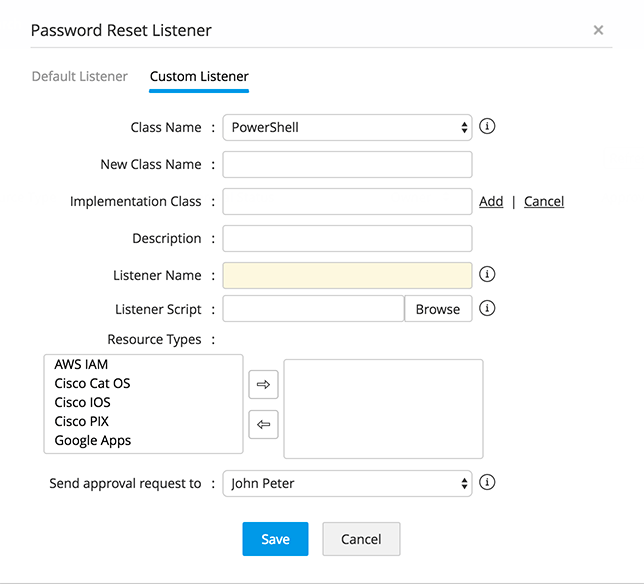 The custom listener basically lets you provide your own listener implementation class, which offers you complete flexibility to execute any post password reset follow-up action, instead of just letting PMP execute the listener script provided by you. It offers you complete flexibility to execute any post password reset follow-up action. How to create a custom listener? Implement PMPListenerInterface (more details in the reference implementation below). Add entries for the implementation class in PMP GUI. To explain how you can have your own implementation for listener in PMP, we are providing a reference implementation below. This implementation is for executing PowerShell scripts with reset listener. You need to write your own class implementing PMPListenerInterface.java as explained below. You may obtain the value of any propery from the list of keys listed below. listenerFilePath - The path of the script/file that you want to invoke as listener. You also have the option to provide the script/file while configuring the listener in PMP in Step 5. In the pop-up form that opens, Click on "Add new" under Custom Listener tab and enter the details. Enter the name of the new implementation class and add your own implementation class. Add entries for your implementation class and also give information about your implementation class in description. Enter a name for the listener script with appropriate extension and then browse and locate the listener script. Select an administrator from the drop down for sending approval request. A mail will be sent to the administrator intimating approval request. You need to convert your implementation class as .jar and put it into <PMP-Installation Folder>/lib directory. After completing the above steps, you need to restart PMP to give effect to this implementation.